I love MS3 based software, so many more tables to get the job done. Some things to consider. - Injector dead time settings- yours are not set, there is a excel spreadsheet in the tech thread that can help get these perfect, if you need i can help with this. -The AFR table needs some work but for now it will do just fine, its nice and safe. -May want to add some spark latency if you notice timing drift at higher rpm, usually a small number 5-10 works well. -Ign table looks conservative, great starting point. Now for your slight oscillation, I am not at a pc that can bring up the datalog but i will take a stab at it. Here are some things to look for, your AFR needs to be around 13.8-14.2 to be stable, however with sequential injection we can go leaner with the right tune. Check for excessive timing oscillation, the timing should move slightly to help keep the rpm stable to much causes surging. You can rule this out by locking the timing out. Next is to go into the Idle settings, try lowering the pid gains slightly do this a little at a time until the oscillation stops. I would first focus on the fuel and timing. It was late last night when we finally got it running and I haven't even revved it > probably 2500 rpm yet. I'm just being very cautious and paranoid as it's my first new motor install and I wasn't sure how well it was running since I'm also not experienced at all with TS and tuning. What would higher rpm be, so I can check for drift? I'll hopefully be getting some time to tinker tomorrow morning/afternoon so I'll pay close attention to the AFR at idle along with timing oscillation. I also realized that I adjusted the idle stop screw last night AFTER calibrating my TPS so I'll need to re-calibrate that tomorrow. I'm not familiar with (ugh I know I'm gonna be saying that a lot! ) the PID and idle settings at all so I'll hold off on that until I understand how to make those changes and what to look for. Thanks for all the advice, I can't wait to get back in there tomorrow and start tweaking and logging, logging and tweaking Happy camping! That is correct this alone will make a noticeable difference. Everywhere I read this seems to be some form of black magic, I would trust Shannon's judgement for now, there seems to be a bit of discord about how important this is at higher rpm. I believe at higher engine speeds this is a moot point, the greatest benefit seems to be at idle/cruise. IMO this is very important for driveability. IMHO just toss in a number between 5 and 10 for now, until your fuel tuned. To check you will need a helper, set a fixed timing amount that is easy to read on the balancer and strobe while your helper brings the rpm up go to around 5.5k. If the timing retards add to the latency. This is fine and will do for now unless rotor timing is a concern, @5.0Thunder can expand on this better than I can. The settings are pretty simple and you can always refer to the little question bubbles. If you want to wait I can expand on this further once I'm home and can do screen shots. Or I can send you my # in our PM chat so I can walk you through it. So I was able to spend half the day today working on the car and it went really well I think but I've got more questions now than I did when I started! The first thing I tried was loading my tune from last night which had the injector dead time and slope settings changes. I was surprised to see that it caused pretty bad idle oscillation of 600 to 1700 rpm and also was running way leaner than before averaging between 15.8 and 19.9 each oscillation. When I realized this I killed the engine and changed from using the table to fixed 20* timing, leaving the injector dead time settings the same. This resulted in a smaller RPM oscillation of 1100 to 1500 rpm and richer AFR of 12-14 each oscillation. This was an improvement over the first run but was running worse than before changing the deadtime settings. While these two runs were logging, I tweaked the idle stop screw as well as the fuel pressure :/ I'm guessing doing this is bad from a logging standpoint as I don't remember when exactly I made those tweaks. I'm new to all this and remembered while the engine was running that I had set the fuel pressure the other day with the vacuum line connected so I wanted to fix that and I adjusted the stop screw then because it was idling too low and wanting to die. Does making mechanical adjustments like that while logging make the data useless since they're external changes? One weird thing that I'm wondering about is the MAP readings I'm seeing seem to be quite low. For the "good" runs I logged today where it was idling really nicely, I did a few low rpm throttle holds at around 2500 rpm and a couple quicker blips up to maybe 4500 or so. During these times I see MAP readings of as low as 33 kPa and when idling it's between 50-60. Am I missing something here? If atmospheric pressure is 101kPa and my numbers are 33-60kPa, does that mean I'm making negative boost? lol Oh, in case it matters, the car is sitting on a lift with no driveshaft during all my tests so far. Is it possible that having zero load on the motor could cause that? To add one last thing, I'm now questioning how I have the blowoff valve and wastegate vacuum lines connected. Since I saw such low MAP readings, I looked closely at them and noticed that the blowoff valve was actually "floating" open while the engine was idling. Is this normal? It would seem to explain the lack of boost pressure since air would just be escaping there, provided the valve didn't close at higher rpm. Sadly I was by myself so I couldn't test revving it up to see higher rpm would close the valve or not. I've been wondering about the wastegate and blowoff valves functioning anyway since I first started it the other night since I haven't heard the "woosh" of them opening up at all but since I'm newbie to all this I'm not sure if that's normal or what. Sorry for yet another long post, I hope everybody's having a great weekend and I look forward to any advice you guys might have. Trust me when I say that the dead time settings must be set correctly, you will need to adjust the ve table to compensate. I can help check this later. Map readings will be low under deceleration and idle map of 40-60kpa is normal. 100kpa is atmosphere, also considered wot no boost. I will touch on the rest later once I'm back. Just touching on the last couple paragraphs here but when your engine is idling with no load, or cruising at light/no load, or decelerating, your engine is creating vacuum, just like a naturally aspirated engine. as one cylinder is being driven down during the power stroke of the combustion process, a difference cylinder is drawing air through the intake manifold past the throttle body and this creates the vacuum readings that you see. 50-60 kpa is normal at idle for a cammed engine and when the engine is decelerating (after rev or off-throttle during cruise), engine MAP will drop down to 20-30kpa or lower. You don't see over 100kpa until the forced induction system builds up enough steam to create manifold pressure. The blowoff has nothing to do with this. It shouldn't be open at idle but this isn't a huge issue, just lets unfiltered air in. When the forced induction system (turbo or blower) builds pressure, the blowoff valve is held shut to contain this pressure. When you let off the throttle, the throttle blade closes and creates that engine vacuum mentioned above, which lifts the blowoff valve open and allows pressure to escape. There is a spring inside the BOV that will ideally keep it closed at idle vacuum but allows it to crack open at full vacuum. My car idles at 55kpa, which reads around 15 in-hg (units of measure) on the boost/vacuum gauge and the BOV is shut. it cracks open around 40kpa (18 in-hg) and below. Ah crap! I only did the "example 1" part of the dead time correction part in the tech thread and totally missed the example 2 part about tweaking the VE table! I have a data log for the first run from Saturday with the new deadtime settings so I'll try to load that up and follow along with the example 2 instructions. It makes sense that it was running much more lean with ONLY the dead time changes and same VE table from the base tune. Let me know if you'd like me to attach the tune and log files from the short run I did on Saturday with the new dead time settings in place or if it's better for me to do a fresh log. Thanks Steve! I spent some time last night learning about how everything works before I saw your message come in. Thanks a lot for explaining, I'm just brand new to turbos and forced induction in general so I was just following install instructions up to this point without understanding exactly how the WG and BV are controlled and work together. Yes you have the idea, the table will need to be adjusted to correct for all the deadtime changes. You can post them here but I wont be back until late tonight, so tomorrow morning I can start looking into the files for everyone again. Half the battle is understanding what your doing and why, in a week or two you wont need much help unless it is to explain what a setting does or how to implement it. Awesome, thanks for taking time to reply even when you're away from home! Reading your example 2 section of the deadtime correction post, it shows comparing the uncorrected vs the corrected PW and deadtime values. Does this mean that I need to look at a log using the old uncorrected values (.8 in my case), recording the average PW at idle and at high RPM, and then doing the same with a log using the corrected values (.4)? That's how I'm interpreting it but hoping you can confirm for me that's the correct way to do it. Also, when you say "high rpm PW", does a throttle blip work for this or do I need to hold it steady at a certain RPM, and how high should this be? Just asking because I haven't really done any high RPM holds yet. If I'm right about how to obtain these values, I'm confident I can apply the correction to the VE table, but less confident in which cells to apply it for idle vs high rpm as well as how to smooth it out. You only need an datalog with with "uncorrected" pw values. The "corrected" values can be interpreted by simply applying the new deadtime changes, no need to datalog an engine that will barely run. the high rpm pw needs to be obtained by running the engine at a high rpm, let's skip this part for now since the pw change is usually moot due to the high numbers involved, lets focus on idle. Ah ok great. All my logs from Saturday where the car was idling really well are using the old uncorrected value of .8 so those logs should be all I need then. Provided this is correct, I would now multiply the Idle cells in my VE table by 1.286 to adjust for the new deadtime? Here is a screenshot of my most recent log, should I do the multiplication on just the cells I pointed out in red, or should it extend out further? I'm guessing that's part of the "smoothing" you mentioned. Step one is to save a current copy of the tune file to revert back to in case things go awry. Then multiply the idle values as you described and blend them in. This will take a bit of trial and error as the math does not always work out perfectly but it's close usually within 3% or so. Start the car and check the fueling if it needs more fuel increase the ve numbers if it needs less drop them. Once the car is idling around 13.5-14 afr highlight the entire ve table and use the blend function to smooth things out should be the button on the far right. So multiplying the ve table at idle by 1.2857 will take you from a 18afr to a 14afr. Your numbers work sir, proceed. Thanks man, I appreciate your help and for reassuring me that what I'm seeing is normal since the car's in the air right now and certainly under no load at all. I'm learning so much during this project so thanks for being patient with all my newbie questions. My goal for the car is to make it a fun daily driver and occasional track car that can give the newer 5.0s a run for their money I don't have target boost numbers in mind yet, and plan to run whatever I can "safely" being that it is a stock block. The motor, turbo, and transmission are all brand new so I'll be babying it for the first 500 miles or so. I'm hoping to learn how to tune things the best I can myself, set up some reasonable safety nets, and eventually take to a dyno once the break-in period is over to do the final tune. This is my first engine swap, turbo install, and tuning experience so it's been a HUGE learning experience already! Go ahead and edit the first post to show all the info about your car that are important to tuning. engine size, injector size, fuel type, turbo size, amount of boost, goals, etc.. I was able to get over to the shop for a couple hours last night to try out my corrected injector deadtime settings. I did my best to tweak the VE table to get the idle close to 14 afr as well as keeping it from going lean when revving through about 4500 rpm. I did have to add a little more fuel at idle over the 1.2857 adjustment to get it to idle less leanly (that's a word right?) and when I then tried selecting the whole table and smoothing cells it made things worse so I just reverted back to manually increasing the low-boost cells across the RPM range. My idle is still oscillating but not too badly, I did notice that it seemed to oscillate more after tuning the idle VE to be closer to 14 afr. When idling a bit more richly it seemed to smooth out some. Hopefully my super wordy file names are helpful, but let me know if you need me to give any additional details. Thanks! 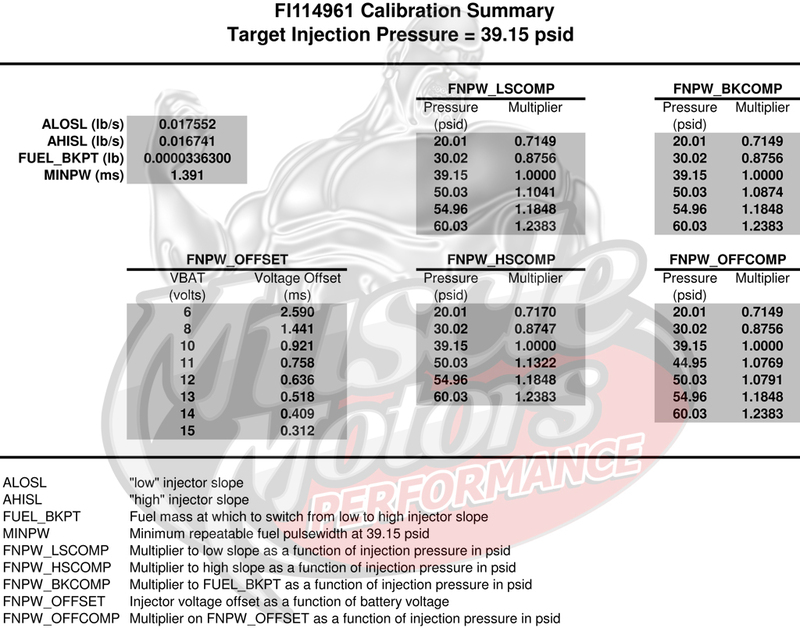 After doing some serious reading on injection timing from many different sources and watching a few videos i decided to adjust the injector timing table for you. I also adjusted the idle correction timing tables, these were set aggressive and caused alot of timing oscillation which will cause surging. I am going to post a link to a guy on youtube who puts out some great videos Andy Whittle is the guys name i believe. Hopefully these small changes help. Thanks Steve! I compared my latest tune to your new rev1.0 and see all the changes you made. It looks like you tweaked the closed loop idle PID gains too like you mentioned would probably need adjusting. Oh, and do you think my VE table is "decent" for now? It's on the rich side, but being a brand new motor I'm sure that's better than it running too lean. Personally what i would do if i were you is get the car warmed up and take a datalog with the new tune, dont make any tuning changes just datalog while do some engine revving. hold the engine at different rpm points do this a few times. then load the datalog into megalog viewer hd along with the tune file you used to datalog with. then run the VE analyzer, set the lambada delay to 3 and the "difficulty" to hard. run the analyzer and accept the changes. Now save the tune file with the same name but rev.1.0.1 now load this new file into the car and do it again this will get the fuel really close to what the AFR table has set as values. Once you are all done (and the car still idles well) load the tune file you made all these changes to and a final datalog of the car running [do not make any tuning changes during this log] for us to review... I will then do some table smoothing for you and make a sanity check to be sure nothing goes south. You could use ve analyzer live but to be honest i trust the analyzer in the megalog viewer much more. 1991 stock 5.0 on3 turbo megasquirt tuning.